Version 7.0.x.8 of GTViewer is available. - FIX - When using the ExternalStyleMapFile entry, the imported style map would not replace a 0 to 0 threshold range with a new specific range. - FIX - If the ExternalStyleDefFile and ExternalStyleMapFile entries were used and an existing def was imported, but a mapping that was using the original def was not updated by the import, the mapping would point to an invalid def. - FIX - The maximum query result fields in QueryInitialize was set to 5 instead of 50 making Type 40 queries fail when performing them with QueryInitialize. Version 7.0.0.2 of GTData is available. - FIX - GTLabelGtg - Mode 2 (auto scale) was incorrectly using the Target Size when it should be ignored for this mode. - NEW - GTLabelGtg - Mode 5 added to support polygons. Label is placed at polygons centroid. - NEW - GTLabelGtg - RequiredLength added for modes 1, 2, and 3. If an elements total length is less than the required length, the element will be ignored. If RequiredLength is 0 (default), all elements are considered. - FIX - GTShapeConv - The last point in the last part of a polyline with more than one part was being dropped. - FIX - GTShapeConv - The Header message was saying the .shp filename for the .shx name. - FIX - GTShapeConv - Did not display error message when unsupported shapefile types were found. - NEW - GTShapeConv - Added support for Polyine_Z and Polygon_Z element. They are converted as 2D elemetns. - CHG - GTTile1 - Changed so that the Offset token is no longer case-sensitive. - NEW - GTTile1 - Scale option added to scale element by their embedded data. - NEW - GTQuery - Prompt queries will no longer count text that is only different by case as unique values. - FIX - GTExtract - Fixed to prevent duplicate records from Thematic queries having elements with the same keys but different filter ids. - FIX - GTConv - Problem with complex elements with arcs. GTI provides a variety of methods for creating GIS applications that utilize GTViewer’s functionality. GTViewer, itself, has an extensive OLE Automation interface allowing its functionality to be easily extended with specific workflows, data capture applications, network tracing and analysis applications, and many more. For those who need even more flexibility, GTI provides GTVx which is an ActiveX control version of GTViewer. While GTViewer and GTVx provide similar GIS functionality, GTVx can be embedded into an existing application or used to build a very streamlined version of GTViewer that only exposes functionality needed by a specific workflow. Together, GTViewer and GTVx cover the entire spectrum of customization and extension capabilities. However, GTI has not stopped with these two applications. Almost a year ago, GTI announced the Pocket GTViewer .NET control and now announces the GTViewer .NET Control for desktop development. These .NET controls provide a new generation of tools for developing applications using GTViewer technology. The Pocket GTViewer .NET control was originally introduced for Visual Studio .NET 2003. This development tool created symmetry with the desktop development options by allowing the developer to either extended Pocket GTViewer with external applications or embedding Pocket GTViewer functionality into existing applications with the .NET control. The .NET control also allows the developer to create very streamlined versions of Pocket GTViewer that only expose functionality need by a specific workflow. Before the PGTV .NET control, there was no equivalent to GTVx on the Window Mobile platforms. Now a year after its introduction, version 7.0 of the PGTV .NET Control has been released and now fully supports Visual Studio .NET 2005 along with many new features such as redline support and a Data Monitor. Perhaps the most significant new feature in version 7.0 is its support for Smartphone platforms (Smartphone 5.0 and Window Mobile 6 Standard) as well as traditional Windows Mobile devices (Window Mobile 5.0, Windows Mobile 6 Classic, and Windows Mobile 6 Professional). So, with a single development tool, you can now target the whole spectrum of current generation Windows Mobile and Smartphone devices. See this posting for more details on Smartphone applicatoins. While GTVx will be around for many years to come and continued development will make it a viable development tool for some time, the simplicity of the PGTV .NET control and its tight integration with Visual Studio .NET begged for an analogous version on the desktop. Of course, GTVx can be used with Visual Studio .NET, but its COM roots (which made so successful for the previous generation of development tools) make it seem antiquated in the world of .NET. This perception is unfortunate since GTVx does work very well with .NET and very sophisticated applications can be easily developed with it in a .NET environment, but forward progress cannot be stopped. GTI is introducing the GTViewer .NET control to provide a .NET specific tool for creating desktop applications. 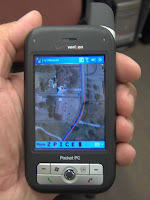 Currently, the GTV .NET control is very similar in functionality to the PGTV .NET Control providing all of the basic GIS functionality needs: Map Display, Redlines, GPS support, Data Monitors, View Management, Queries, Display Filter Support, and Raster backdrop support. In future versions, more functionality will be available in the desktop control simply because it does not face the resource limitations imposed by mobile devices. Together the PGTV .NET control and the GTV .NET control provide a common development framework for building applications for the desktop, mobile devices, or phones. These next generation tools will keep GTViewer and Pocket GTViewer at the top of their game by leveraging the many benefits Visual Studio .NET and the .NET framework in general have brought to developers. For more information on the .NET control or if you would like to try one of the .NET control, please contact GTI. GTI recently conducted interactive web-based training on Pocket GTViewer and Damage Assessment applications. Sixteen local government agencies will participate in a first-ever regional disaster response exercise, Tuesday, June 19, that includes a damage assessment of the conditions after the earthquake. The mock disaster will involve nearly 100 people in Mississippi, Arkansas, and Tennessee working with a scenario based on a 7.7 earthquake along the New Madrid fault. Outside assistance is likely to include the other participating municipalities and counties, which are part of a growing, regional Rescuer/Responder Assistance Information Network (RAIN). RAIN is currently a loose knit group of city/county agencies that are setting up shared data and common software so they can provide mutual aid in the case of a wide-spread disaster. On June 19, the agencies will be viewing, collecting, and sharing critical post-incident information to each other, to six local Emergency Operations Centers (EOCs) and to state directors for Tennessee Emergency Management Agency (TEMA) at the West Tennessee Operations Center in Jackson, TN. An additional mechanism for access will be an interactive internet site setup to view and analyze information that will be a compilation of information acquired on the 19th and available to Emergency Management officials with a password. By the end of the day, agencies will be viewing and analyzing information which could help assess initial damage and arrange for triage. This will be done in the various EOCs and on the internet. The test will assume most conventional communication such as telephones or cell towers is limited or nonexistent, and that movement throughout the area will also be limited. “We want to decrease the amount of time it takes to get critical information into the hands of the actual responders. New mobile technology allows us to provide specific assessments on casualties or injuries, and for damage to roads and bridges, utilities, trees and vegetation, and structures – very quickly,” said Vic Young, Facilities Management & Mapping manager at Fisher & Arnold, Inc., a Memphis-based engineering firm assisting with the exercise. “Realizing that many times the first responder is not police or fire, we have placed much of the search and rescue information on the mobile devices of day-to-day field users associated with utilities, code enforcement, inspectors, and engineering. These employees could be in their normal mode until emergency management information is needed, and then deployed instantly. Germantown, Olive Branch, Dyersburg, and the City of Memphis have, or will soon have this capability”, according to Young. The responder can drive down the street and see each house with information such as who owns the property, the location of gas cutoffs, or the location of damaged homes. Being able to quickly collect detailed damage information on your mobile phone or PDA allows the task to be completed in hours instead of days. The digital record is in the right place in space and can be sent immediately to the Emergency Operations Center and viewed on the monitors. Version 7.0.x.7 of GTViewer is available. - NEW - Export View now supports Bitmap files (.bmp). - FIX - Export View was disabled if the DGN export was not configured. - FIX - If a MrSID file was not found, it would give a cryptic message and not log the details of the problem. - NEW - GetElementPointList now accept point Type 10 to use elements in a group to get a stroked pointlist. - FIX - Thematic Queries using the GetAllComponents flag would have duplicate records when elements with the same keys differed only by filter id. Version 7.0.x.3 of GTVx is available. - NEW - The ShapeBorderColorId and ShapeBorderColorValue only applied to Shape with Holes elements in the past. It will now apply to a regular shape element as well. - NEW - Smooth Zoom Out added. - NEW - The unhighlighting of feature when the pick list menu is present for feature selection when multiple are present at the selection point has been changed. Previously, the unhighlighting process did not restore the view to its previous state if the features were stacked with a specific priority. - NEW - The picklist resulting when multiple features are at the same location will now flicker the element when it is selected in the picklist. - FIX - Window Area Zoom In on a point when zoomed very far out would often not set the view to the desired range. - NEW - New DataProperty called RightMouseMenuMode. If set to 0 (default), the right mouse menu works as it always has. If set to 1, the right mouse menu will only display when features are selected for review; no other menu items are displayed. - NEW - The ExportView method now support Bitmap files (.bmp) as an export output. - NEW - The GetDataProperty and SetDataProperty now support the SmoothZoom property. If set to 0, the old zoom out method is used. If set to 1 (default), the new zoom out method is used.